Is The Canik Tp9SA Good For Concealed Carry? Blog Is The Canik Tp9SA Good For Concealed Carry? Reviewing firearms is a risky business for the reviewer, after all if the firearms do not perform to the standards expected or portrayed by the reviewer people will quickly blame them. It is essential to understand in advance that I have NEVER held a firearm or any man-made implement that did not have the propensity to fail. However, the entire point of a solid product review is just doing it! Owning solid tools, that have failures regardless, means quite simply that while I do own some extremely well-made products that have yet to have a catastrophic failure, I have seen and had minor failures occur in all items. Such as ammo feeding issues and barrels wearing out causing key-holing (the round is not stabilized properly and often tumbles prematurely) one of my favorite firearms an 8-year-old Delton has had 4 barrels in it and several sets of springs. Maintenance is absolutely essential, changing oil and spark plugs in vehicles and springs in firearms! Canik is a Turkish-owned subsidiary of the Samson Yurt Defense company, Canik USA is based in the United States and like Glock USA while foreign owned, produce an amazing, very solid piece of hardware at a respectable price. Unlike many, I will NOT buy certain well-made items based on where they are made. Though I do have some principles with regards to my inherent freedoms and “God-given” rights, we live in a global society. Chevy, Ford, GMC etc., are not even fully made in the USA anymore. Yet, people swear unless you own one…you must be a traitor. Upon receiving the Canik Tp9SA in flat dark earth I was immediately impressed with the packaging and what it came with. It is almost identical in size to the Glock 17 and looks very similar to the Walther P99 in its look. It comes with two grip inserts allowing for someone to more easily adjust the firearm to fit them. Also included is a Blackhawk Serpa styled level 3 retention holster (good for LE or Security purposes but difficult for the average shooter to use.) This holster has an OWB and an IWB setup, though this model handgun would be more difficult to carry concealed, it can be done. Two magazines, made by MecGar Magazines of Italy (amazing magazines are made by this company) are included, and for the states where it is allowed, you get 18 rounds of available space in each. Yes, folks that is 36 rounds of Gold Dot 124 grn or whatever your personal favorite carry ammunition is on tap and ready to roll once you load them up. I spent the extra money and grabbed two more magazines, giving me a total of 72 rounds +1 when carrying this handgun. Now the kit with the included two magazines was, after shipping and FFL fees, $352 total invested when I picked it up. Coming in at $450-$575, my personal favorite carry gun, is the Glock 19 and it is still less expensive than most other handguns, definitely better quality than any other in its price range. Now my personal habit with all firearms upon receiving them initially is to break them down and put them together again several times, becoming familiar with how they function. In some cases, I will strip them down to their individual pieces, though after one interesting 3-day affair with a NAA mini revolver I decided that a basic strip and clean was enough for testing purposes. This firearm is absolutely the easiest to break down I have ever had, and I do mean ever, including at least three cap and ball and one flintlock I owned at one point. After the second time, I could do it blindfolded with one hand. It is that easy. I cleaned it thoroughly and lubricated with my personal favorite lubricant; Ballistol, (I have yet to find one better, and folks, I have shot a lot, as in well over a million rounds and used every readily available lubricant under the sun). Ballistol is water soluble, and yet protects from water damage, it is a “green” material, and food safe, so you can use it on your good kitchen knives, it works on almost every surface that needs lubrication, and only needs to be mixed with water to better match the needs of the material to which it is being applied. I use it on door hinges, (better than wd40) and soak rusted parts in it (amazingly bringing back from the dead several expensive tools that were completely frozen with rust over the years. However, this is not a product review of Ballistol, that will come! I grabbed 200 rounds of Gold Dot 124 grn, 200 rounds of Aguila 115 grn and 700 rounds of MEN (german milspec ammunition) 124 grain NATO specification and power rounds and hit the range. Now before continuing, there is a difference in NATO specifications and SAAMI specifications (what we are used to with American ammunition companies.) In 9×19 that difference is almost 1100 ftlbs of pressure. The MEN is loaded to a little over 36,000 ftlbs while for instance the Aguila is loaded to 35,000 ftlbs. Now for the average shooter this means nothing, however, it should. These measurements are of the pressures generated by the round when it is discharged, and there are MANY current USA based companies that make smaller 9×19 handguns that are NOT rated for higher pressured ammunition. The Canik is designed with NATO specs in mind, meaning, it can handle +P+ if you want it too. Personally, I see absolutely no legitimate reason to do this as it negates the reason for 9×19 in the first place, a solid round that is easier to shoot than .40sw or .45acp. Again, ammunition types will need to be another product review. For myself, I stock the MEN and or IMI (Israeli Military grade ammunition) ammunition simply because it is already sealed. Generally, when compared to local USA brands the ammunition is within .02 cents per round and I do not like nor do I see the benefit in using fingernail polish or other home brewed sealants when I can buy a case at a time for sometimes less than unsealed less powerful American ammunition. An additional reason I stock it is that these two manufacturers tend to run their tolerances into match grade range, with standard deviations under 8 for IMI and well under 10 for MEN handgun rounds. (Standard deviation is a difference in how each bullet performs and is essential when accuracy is necessary.) However, this is also another product review, differences in ammunition types and why it matters. Upon hitting the range I loaded up the magazines with Aguila, (except for one magazine of MEN) I shot a group at ten yards with the MEN using a sandbag for a baseline, and then I ran the entirety of the Aguila through it testing reliability. As was expected thanks to other reviews available, I did not experience a single issue. After 218 rounds I shot another 18 round group at 10 yards from a sandbag and then proceeded to run the Gold Dot through it, sometimes looking for accuracy and over the course of the 200 rounds I dropped magazines, the handgun and more and still had no issues or stoppages. One more group sandbagged and I began the testing of its durability, I had several containers of mud, silica sand and dirty and clean water and started trying to force a problem. It functioned well with sand regardless as well as water both dirty and clean. I had one failure to feed with the mud but after rinsing it off in the water, it kept on chugging. With a little over 100 rounds left I decided to raise the stakes, I drove over it twice with the 4 Runner, (I have the SR5 V8 and it isn’t light) that failed to stop it or cause issues so I decided to step it up a notch and put it on safe and threw it down into a rocky gully, (now I can see many of you flinching, however, there is a reason to the madness.) After limping my way down into the gully (about ten feet or so) I picked up the now slightly scarred but still functioning firearm and put a magazine through it. Yes! It had NOT discharged when thrown. Yes, I was behind cover and yes, I do this with other firearms. NO, I do not do this with others around, that would be endangering them. I crawled back up moving a bit slower now as the back was starting to complain, and finished off the last of the rounds. Leaving just 18 for the final accuracy test. Here is what I liked about this amazing handgun. It is accurate, not as accurate as a 1911 or a competition gun, however, it is as accurate as the Glock and Springfield XD out of the box and more accurate than the S&W MP. Its accuracy held within a half an inch from first group to last. And bagged at ten yards I shot 3” to 4” 18 round groups. NOT three or five or even TEN round groups, but a FULL magazine! Easily could have made sub 2” 5 round groups. The trigger is FAR better than the Glock out of the box, as good as the XD and light years ahead of the MP – honestly, it is better than the Walther P99 as well, however, I have only shot one of those and never liked them. It is crisp, the reset is short and sweet, no mushy take up, just a smooth press, glass breaking, and smooth clean SHORT reset. The sights are horizontally adjustable, on the SF version they are also vertically adjustable. Unfortunately, the sights it comes with are what you get for now, I am sure companies will have after-market sights for them soon, however, at-the-moment, the after-market parts availability is nonexistent. They are a standard three dot and NOT night sights, though they are easy to pick up and I had no problem mounting my gun lights on the rail. It does have a decocker, it is directly in front of the rear sight, you depress it and it decocks the gun so you can safely take it down. (Field strip it) This seems to be an issue for people buying it, honestly, I found it to be a nice addition. And at no point did I worry about accidentally decocking the gun while running it. It is a striker fired handgun, with a bright red easily visible pin that shows a loaded chamber. I used the larger grip insert and found changing them to be relatively easy to do. 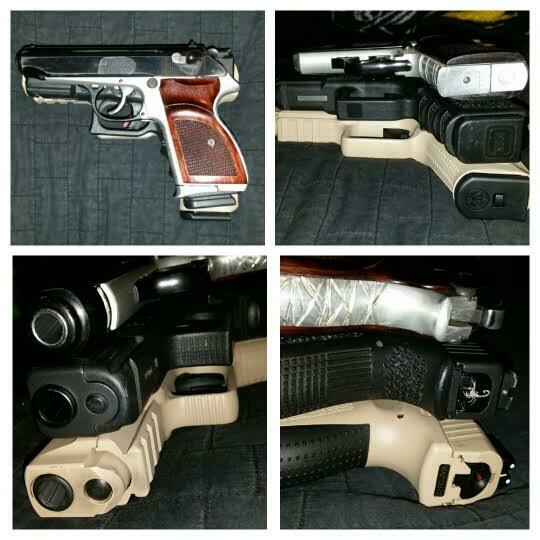 I also found several companies building reasonable Kydex holsters for this gun so you have options. The grip itself was very nice, while I am far more used to the Glock right now, I honestly could not see the grip being a bad thing for anyone, in fact for new gun owners, the ability to change sizes would be a plus. It has a few extra springs and moving parts when compared to the Glock, however, again, over 1000 rounds and extremely harsh testing with only one minor issue; mud causing a failure to feed of the round into the chamber. I doubt those are a concern. The factory has videos up and has run testing to 60,000 rounds per NATO specifications without an issue. It comes with everything you need EXCEPT a magazine holster, which is easily purchased on Amazon for $15-$20. (Double stack magazine holder) So as a beginner or even advanced package for self-defense, it is perfect! Do NOT buy this gun if you are considering a competition career. It is built as a duty weapon and while I doubt the average owner running 100-200 rounds a month through it for practice would ever reach its lifespan, if you run 2000 plus rounds as a competitor, you will wear it out rather quickly. This doesn’t mean it is not a fine firearm, simply that it is not designed for competition or day upon day of use and abuse that will last for decades. This is a tool, specifically designed to shoot where it is pointed, and it works easily 90% or more of the time, Regardless conditions, IT IS NOT a tool for precision match shooting nor is it for an advanced shooter. Would anyone enjoy using it… YES, however, if you have been shooting for decades you will surely find flaws that the average shooter wouldn’t. So, there you have it. Another product review, and yes, possibly more money spent. However, I can say one thing for certain, if you buy this for someone else, don’t shoot it yourself – you will want to keep it. I really like mine! I own 2 Caniks, and agree with your review, they are very good firearms… No, they are not competition pistols, but I have many many rounds through them, and am seeing no significant wear. These pistols stack up in quality and reliability to any service pistols made… IMHO, they surpass Glock, out of the box, as my SA needed NOTHING added, changed, or replaced to make it run like a top… I just do not want readers to think that they will poop out any faster than the others. People need to handle and shoot these pistols to believe them…. Thanks Much for a good review.